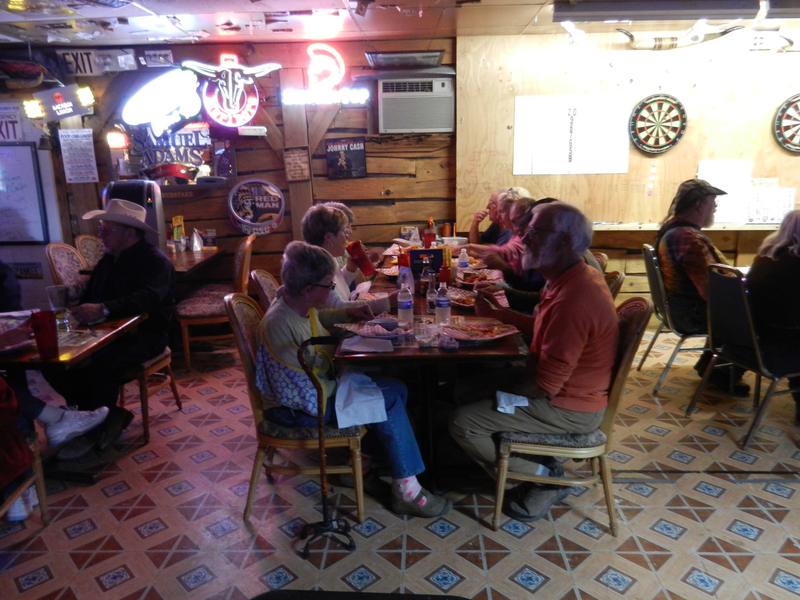 I just wanted to update you on all the latest happenings in Quartzsite. The weather has been getting much warmer with temps being in the low 70’s during the day and high 30’s at night). The last couple of days have really been beautiful with calm days and no clouds. A few of us decided to walk into town to the produce market next to the post office. They have some really nice produce. 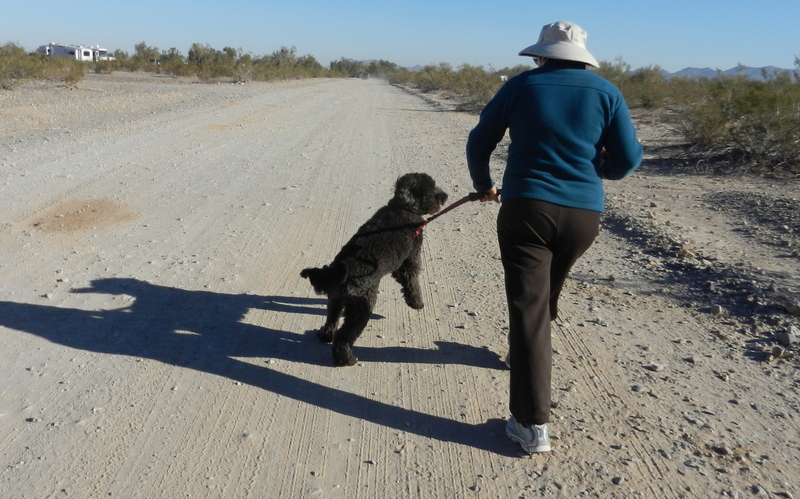 On the way as we were walking down Old Yuma Road, Frank and Cookie drove by with their dog Buddy in the back seat. That really set off Sadie (John and Linda’s Labradoodle). She wanted to see Buddy. She started jumping up and down like a jackrabbit. I took a couple of pics but it didn’t really show how she was jumping. At times all 4 paws were off the ground. On the way we ran into this guy who had a really neat red RV. He happened to be working on his engine so I stopped by to have a talk. 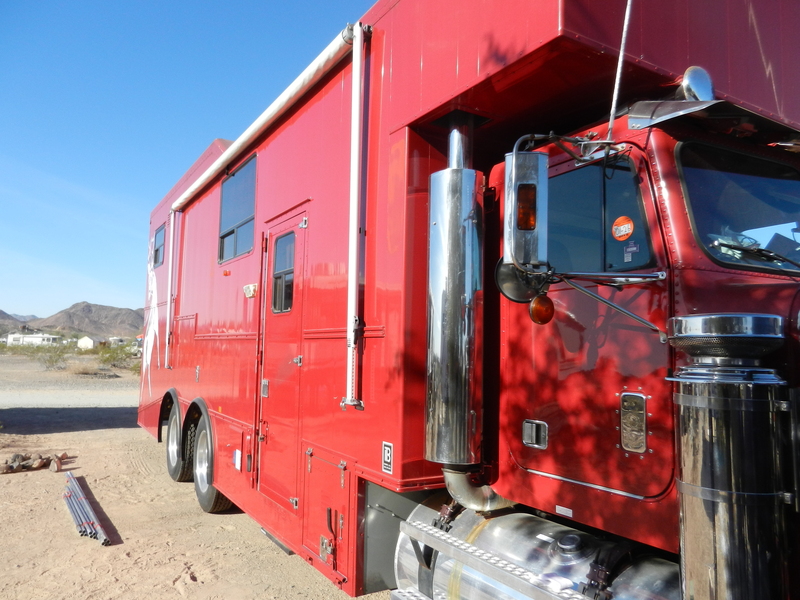 His rig was actually a custom built toyhauler with room for a small car under the back bedroom. He even gave John and I a tour of the inside. It was very spacious and very well built. We didn’t recall seeing any windows but after looking at the outside pic there is a couple. They must have had the blinds closed because everything looked rather dark. Not like our bright Lazy Daze rigs. The following day several of us headed to the Laundromat and then off to the Grubstake for lunch. It is getting more crowded every day as it approaches time for the RV Show which starts on Saturday 1/21. We were all lucky to get to the Laundromat without having to fight too many people for either a parking space or a washer/dryer. In a few days it will be an absolute madhouse all over town. Linda and I walked down to the bakery about 2 blocks from the Laundromat while our clothes were washing. As you approached the building you could smell all the wonderful things they were baking. I picked up a loaf of freshly made French bread and a couple of apple fritters, while Linda got a loaf of bread and a couple of bear claws. Then we returned and finished our laundry. We all planned to meet at the Grubstake for lunch later on. Their food is sooooo gooood!!! Most of us had the $5 fish special and Roger had the hamburger. I didn’t hear any complaints about the food whatsoever. It is a great place to eat. Again we were able to walk right in and get a table. I wonder what it will be like in a few days. 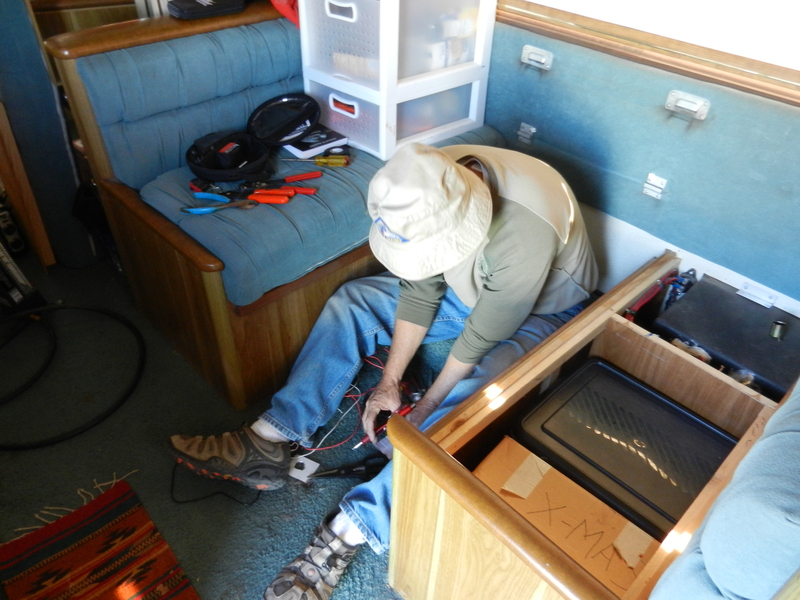 On Friday John and Rodger came over to install a 12v receptacle under my dinette. 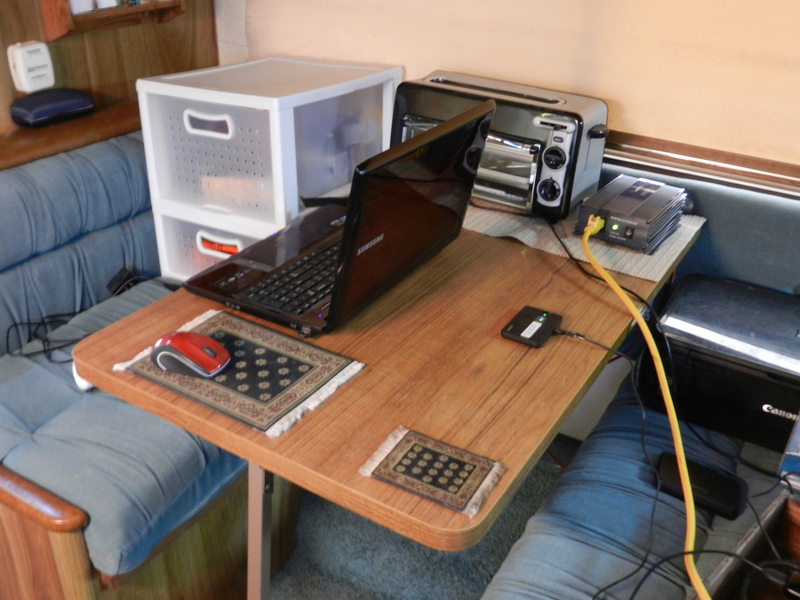 Previously I had to hook up my inverter on the other side of my rig and run an extension strip to my dinette to power my computer and charge my phone, camera and both of my Kindles. This is a pic of John installing the receptacle. That is one of the GREAT benefits of meeting up with other Lazy Daze folks. Everyone has great ideas and they are willing to help you with improvements on your rig. Here is a pic of my inverter at work in its new spot. This is so much better than dragging the 10 ft extension across my floor. That evening we planned a wiener roast for dinner. We had all the hot dogs and fixin’s and a lot of GREAT side dishes. It was a super meal and everyone had a good time. Then we all sat around and had great conversations about anything and everything. I think everyone has decided to stay home for the weekend and refrain from going to the big tent which contains the RV Show. I went last year on the first day and it was way too crowded. So we will probably head up there either Monday or Tuesday. I will take lots of pics to show you what is going on. 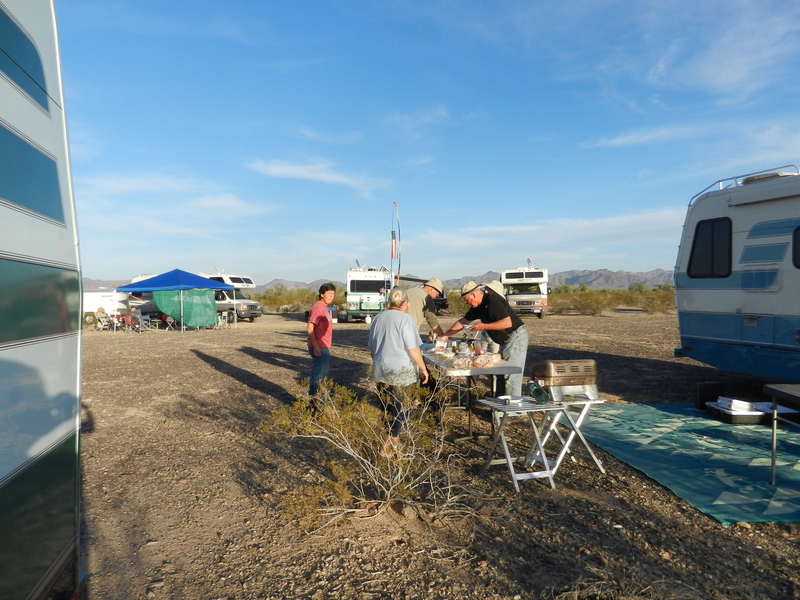 This entry was posted in Arizona, BLM Land, Boondocking, Hiking, La Posa BLM, Lazy Daze RVs, My Friends, Quartzsite, Quartzsite Lazy Daze Rally, RV Rallys by Jim Melvin. Bookmark the permalink. Thanks for the updates on your trip. 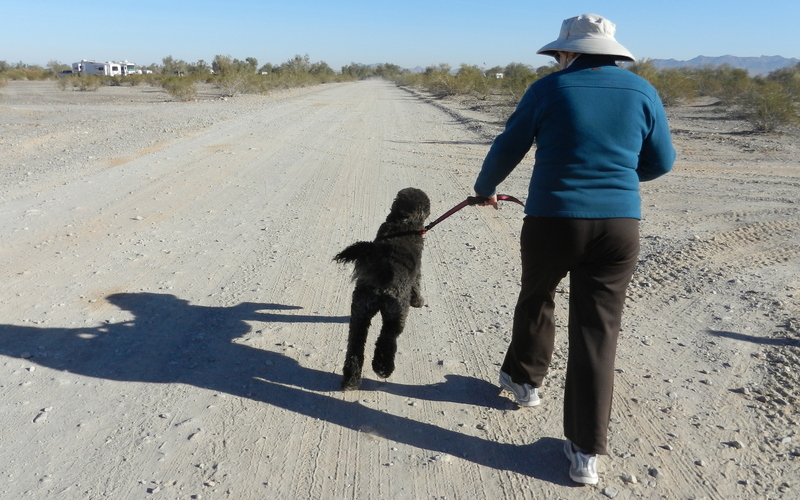 I follow another Blogger RVSueandhercaninecrew, she is there in Quartzite too. Hubby and I sure wish we could go full timing. Our age difference and lack of planning when we were young financially keep us from being able to do that. 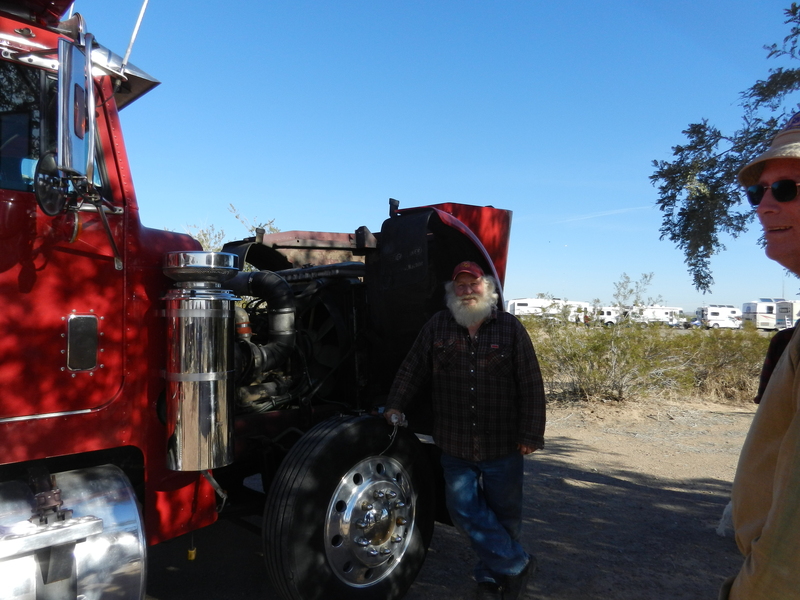 He retires next month, but i still have 13 years before I qualify for Medicare and we can’t afford the health insurance, but I love living life on the the road through all the bloggers, thanks you so much for your posts. I will be awaiting your blog and photos on the RV show. The grubstake story today has sure made me hungry, I can almost smell the fish fry. Nice post, Jimbo. 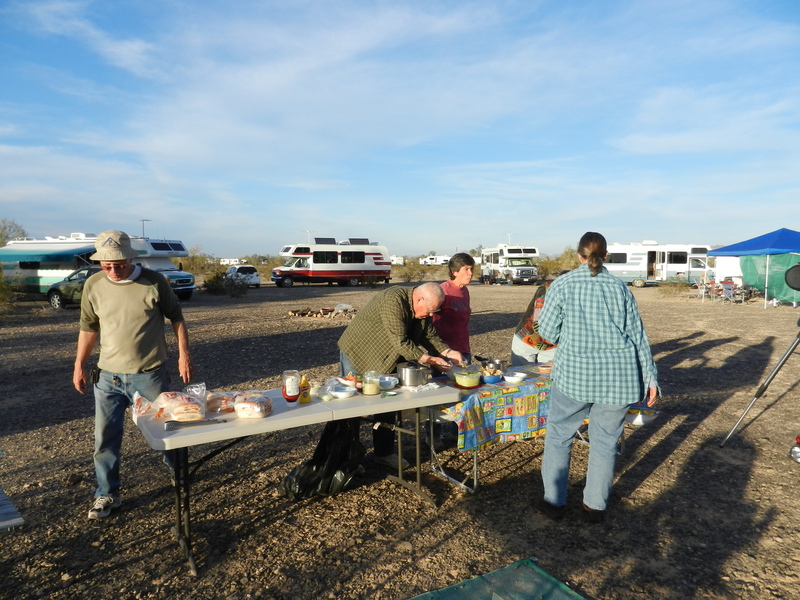 It makes those of us who have not been able to get Quartzsite still feel a part of it. Thanx. You suffering soul. I don’t know how you stand it! Oh well. Back to honey dos. That “Big Red” is sure a whole lot bigger than our Lazy Daze. I bet it was interesting to look at but I think the lack of windows would bother me. I sure like the open, airy windows that Lazy Daze puts in. Sounds like you are having a good time. Not just any toyhauler, Jim, but Santa Claus was it you saw. He was here too. Check my blog!